Occurrence: As fruit, juices, jams, jellies and preserves. Like many other allergies to fresh fruits and vegetables, peach allergy can take two different forms. In the North of Europe, people with birch-pollen allergy can develop a peach allergy due to the similarity between a protein in birch that causes birch-pollen allergy, and a peach protein. This is called the birch-fruit syndrome with symptoms generally appearing within 5-15 min after consuming raw peach and comprising local reactions in the mouth and throat with itching and inflammation (called oral allergy syndrome, OAS). The molecule, known as an allergen, involved in this kind of allergy does not survive cooking. Therefore, people who react to this allergen can tolerate cooked peach and juices. Individuals often develop adverse reactions to other fruits including apple, pear, apricot, cherry, melon, banana, nuts such as hazelnut, or vegetables such as celeriac (celery tuber) and carrot. In Mediterranean countries, people with peach allergy do not have birch-pollen allergy. Symptoms are more severe including generalised urticaria, abdominal pain, vomiting and life-threatening symptoms, sometimes in addition to the OAS. These individuals tend to have more frequent and severe reactions when fruits are eaten with the peel. They also tend to develop adverse reactions to other fruits including apple, apricot, plum, cherry, nuts (such as hazelnut and walnut) and peanut. The protein (allergen) that causes this kind of allergy is tough and the allergenicity survives in processed foods such as purees, nectars and juices. As a result, individuals with this kind of allergy cannot eat even cooked peach. 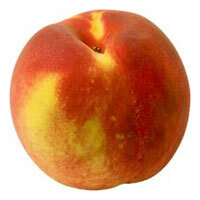 Peach is a stone fruit belonging to the Rosaceae family of fruits. This family comprises many of the most widely consumed fruits in the western countries such as apple, pear, strawberry, and the stone fruits apricot, plum and cherry. These fruits are the foods most frequently involved in food allergic reactions in adolescents and adults in Europe. Females are affected twice as frequently as males. Apple allergy is the most frequent food allergy in Central and Northern Europe in areas rich of birch trees, whereas peach is the food most frequently involved in allergic reactions in the Mediterranean area in countries such as Spain, Italy and Israel. Most of the patients allergic to peach notice itching of mouth and throat, and itching, redness and swelling of the lips, within the 5-15 minutes after eating the fruit, or even while chewing and swallowing it. These symptoms relapse 15 to 60 minutes later. This is known as the “oral allergy syndrome”. Some patients present more serious reactions after peach intake, preceded or not by the mouth symptoms, and with a variable involvement of the skin, the stomach and nose or lungs, and/or anaphylaxis. In the skin involvement patients develop wheals (urticaria) with or without swelling (angioedema). When present, swelling most frequently affects face, lips, and eyelids. In the stomach patients may experience burning or pain, cramps, vomiting, and/or diarrhoea. The nose and lungs are less frequently involved, and patients present with itching of the nose, sneezing, and watery discharge (hayfever or rhinitis) and/or cough, chest tightness, wheezing and short breath (asthma). Some peach allergic patients may develop generalised reactions with involvement of the skin together with other organs. These generalised allergic reactions are known as anaphylaxis, and are a medical emergency. Fortunately, only a minority of patients with anaphylaxis present a decrease in blood pressure (hypotension). This is the most severe and life threatening allergic reaction known as anaphylactic shock. Other life threatening reactions such as severe asthma attack or glottis oedema are exceptionally observed. There are regional differences in the manifestations of peach allergy within Europe. In North and Central Europe peach allergy is observed in patients allergic to birch pollen. These subjects generally have other plant food allergies involving Rosaceae fruits (apple being the most frequently associated), nuts (especially hazelnut), and vegetables (mainly celery and carrot). All these plant food allergies linked to birch pollen allergy have similar symptoms and development. The food allergy is a consequence of birch pollen allergy: patients first become allergic to some proteins (allergens) of birch pollen, and they secondary react to similar allergens present in the foods (cross-reactivity phenomenon). The most important allergens are easily destroyed by cooking and the digestion process (labile allergens), and thus can only induce local contact reactions in the mouth and throat where they are still intact. This explains why oral symptoms are for most of the patients the unique manifestation of this food allergy, and why reactions are only induced by fresh peach; commercial peach juices, peach in syrup, or peach jam are generally well tolerated. However, in Southern Europe – Spain and Italy – and Israel, in areas without birch trees, peach allergy is more severe. The majority of patients have symptoms from the mouth, but generalised reactions such as hives (urticaria) and anaphylaxis appear in more than 1/3 of patients. All the patients react to fresh peach, when it is eaten with the peel, whereas some of them can tolerate the ingestion of the peeled fruit. Foods containing processed peach commonly induce allergic reactions. A frequent (>50%) and characteristic complaint in these patients is the appearance of wheals in hands, forearms, face and neck when handling or peeling raw peaches, due to the contact with the fruit peel. For some patients this is the first manifestation of peach allergy, and sometimes the only one since it prevents them from eating peaches. The severity and the special characteristics of peach allergy in the Mediterranean area are related to one particular protein that is the most important allergen for South European patients. Since this allergen resists the digestion processes, it can induce local contact reactions in skin, mouth and throat, as well as reactions in distant organs after it has been taken up by body. Its resistance to high temperature explains the reactivity of patients to processed peach foods, and its abundance in the peel of the fruit explains the special reactivity to peach peel. Since all the people eating peach are exposed to its lipid transfer protein, why does only the Mediterranean population get sensitised to this allergen? This puzzling question is not yet answered. Differences in the genetic background, in dietary habits or in pollen exposure could be on the basis. Whether the exposure to some local pollens such as those of plane tree or mugwort may favour this fruit allergy is currently under investigation. Peach allergy is suspected on the basis of the medical history which establish the relationship between the contact with the fruit and the appearance of symptoms, it is supported by the demonstration of allergy antibodies by means of skin and blood tests, and it is confirmed by an oral challenge. The best test to demonstrate a reaction to peach is the prick-prick test with fresh peach. In this test the lancet is plunged several times into the fruit immediately before pricking the patient’s skin with it. The frequency of positive results in allergic patients is high, generally over 90%. Peel and pulp can be tested separately. False negative skin tests are frequently found with commercial peach extracts, especially in patients sensitised to labile peach allergens which can be modified during the extract preparation. This factor can also reduce the diagnostic performance of the commercially available blood tests. In the clinical practice it is rarely indispensable to make oral challenges to confirm the clinical suspicion if the symptoms are unequivocal (which is almost always the case), and the patient presents specific IgE to peach. In those patients with anaphylaxis in whom specific IgE is demonstrated, oral challenges should not be performed. The only recommendation to peach allergic patients is the strict avoidance of the fruit. This is especially important in those patients from the Mediterranean area sensitised to lipid transfer protein who are at risk of severe reactions. They should avoid fresh peach as well as peach processed products. Certain patients with previous anaphylaxis or anaphylactic shocks should be trained in the early recognition and treatment of reactions in case of accidental ingestion, and given rescue medication including adrenaline. Patients with peach allergy linked to birch pollen allergy should avoid fresh peach. Avoidance of peach processed products is generally unnecessary, but if their tolerance is unknown it should be assessed at the allergy clinic before allowing their ingestion. If the tolerance to a related cross-reactive food (such as other Rosaceae fruits) is not known or has not been assessed after a confirmed diagnosis of peach allergy, patients should avoid it. This is especially important in patients sensitised to lipid transfer proteins who have had serious reactions with peach. Lleonart et al. (1992)  reported local cutaneous and generalised reactions following ingestion, contact or inhalation of peach dust (48 patients, 35 women and 13 men) . Pastorello et al. 1994  report data from 21 patients of whom 19 showed symptoms to peach. 17 had oropharyngeal symptoms (oral irritation, local itching, angioedema, throat tightness, lip tightness, oral mucosal papules or blisters) and 2 gastrointestinal symptoms. van Ree et al. (1995)  reported symptoms for 16 patients as: 4 oral allergy syndrome (OAS) alone; 4 OAS and contact urticaria; 1 contact urticaria; 1 urticaria; 3 OAS, contact urticaria and urticaria; 1 contact urticaria and gastrointestinal symtoms; 1 OAS, contact urticaria and gastrointestinal symtoms; 2 anaphylaxis. Sanchez-Monge et al. 1999  reported generalised urticaria (2/10), anaphylaxis (3/10); anaphylactic shock (1/10), oral allergy syndrome (7/10) ; cutaneous reactions (5/10). Pastorello et al. (1999)  report symptoms from 15 patients as 7 OAS; 1 angioedema if touched; 2 urticaria and angioedema; 1 OAS, urticaria and vomiting; 1 OAS and glottic edema; 2 urticaria and glottic edema (anaphylaxis). Garcia-Selles et al. (2002)  report 12/47 patients with anaphylaxis, 24/47 with urticaria or angioedema, 6/47 with oral allergy syndrome and 5 with contact urticaria only to peach. 24 reacted to apple (divided as above 6/24, 11/24, 5/24,2/24) and 10 to chestnut (3/10, 3/10 and 4/10 with oral allergy syndrome). Rodriguez-Perez et al (2003)  reported symptoms from 29 patients as oral allergy syndrome (19/29), contact urticaria (14/29), urticaria (7/29) and a single case of anaphylaxis. Garcia-Selles et al. (2002)  and Rodriguez-Perez et al (2003)  used purified natural Pru p 3. Garcia-Selles et al. (2002)  also used commercial peach, apple and Artemisia pollen extracts, a 5% (w/v) saline extract of chestnut, fresh peach peel, and purified LTPs. Sanchez-Monge et al. 1999  used a commercial peach extract. Cuesta-Herranz et al (1998)  used fresh peach, both skin and pulp. Garcia-Selles et al. (2002)  and Rodriguez-Perez et al (2003)  performed SPTs with purified natural Pru p 3 at a concentration of 20µg/ml. Histamine hydrochloride (10 mg/ml) and saline solution were used as positive and negative controls, respectively. Wheals areas 7 mm2 greater than that produced by the saline control were considered as positive. Sanchez-Monge et al. 1999  considered wheal areas at least 5 mm2 greater than that produced by the saline control as positive. Cuesta-Herranz et al (1998)  used a prick-prick test. Garcia-Selles et al. (2002)  reported SPTs on 47 patients. Rodriguez-Perez et al (2003)  reported SPTs on 29 patients. Cuesta-Herranz et al (1998)  tested 70 peach allergic patients and 95 pollen allergic controls. Sanchez-Monge et al. 1999  reported positive SPTs for all 10 patients with both peach and apple (13-128 mm2). Garcia-Selles et al. (2002)  reported that positive SPTs for 45/47 peach allergic patients with peach extract and 44/47 with purified peach LTP. The non-responders had low but significant specific IgE tests to peach by CAP (0.7, 1.2 and 1.3 kU/l). The wheals were generally smaller and there were fewer positives for extracts and purified LTPs from apple (41/47 and 36/47), chestnut (18/47 and 11/47) and Artemisia pollen (27/47 and 17/47). Rodriguez-Perez et al (2003)  selected their 29 patients as showing positive prick-prick with peach. 14/29 patients gave positive SPT with Pru p 3 and negative CAP to rBet v 2. 15/29 exhibited positive CAP to rBet v 2 and negative SPT to Pru p 3. This suggests that the patients are either sensitised to the nsLTP Pru p 3 or to profilins but not to both allergens. Cuesta-Herranz et al (1998)  found that all the peach allergic patients gave positive prick-prick tests with peach pulp. However, 83% of the controls gave false positive results. Pastorello et al. (1994)  used the peel of each fruit, which has a higher protein content and allergenicity than the pulp. The peel was homogenized (1:5 w/v) by a high-speed spinning-blade homogenizer in potassium phosphate buffer 10 mmol/L, pH 7, containing, in 500 ml, 10 g. of polyvinylpolypyrrolidone, 0.8 g. of diethyldithiocarbamate, 0.327 g. of ethylenediaminetetraacetic acid disodium salt, and 0.09 g. of sodium azide. The homogenate was centrifuged at 40,000xg for 30 minutes, and the supernatant was dialyzed for 20 hours at 4° C against phosphate buffer 10 mol/L, pH 7. It was then centrifuged again at 3000 rpm for 10 minutes to separate any precipitate. Pastorello et al. (1999)  report a similar method to make their extract for immunoblotting. This was concentrated with a using a Centriprep 3 concentrator (Amicon) with a MW cut-off of 3000 Da for purification of the allergen. Rodriguez-Perez et al (2003)  used sera from 29 patients. Pastorello et al. (1999)  used sera from 15 patients, 3 with a history of anaphylaxis and 12 with a positive open challenge to peach. van Ree et al. (1995)  used sera from 16 patients (8 male and 8 female) with a mean age of 21 years (range, 14 to 27 years). All had symptoms of grass pollinosis and reported reactions to peach. Rodriguez-Perez et al (2003)  report that 17/29 patients had specific IgE against peach (0.6-17.9 kU/l) and 15/29 had specific IgE against Bet v 2 (1.7-20.0 kU/l). All the peach allergic patients either had IgE against Bet v 2 or a positive SPT with Pru p 3. Pastorello et al. (1999)  reported that all 15 patients were CAP positive for peach extract (2.04 to >100 kU/l). 7 patients had positive IgE levels for birch pollen (1.20 to >100 kU/l) but only 3 had clinical symptoms for birch. van Ree et al. (1995)  reported RAST (and SPT) data showing sensitisation to pollens and pollen profilins. By RAST inhibition, it was shown that IgE to peach and apple was largely cross-reactive with grass pollen (average inhibition of the peach RAST with 75% for 10/11 sera). Pastorello et al. (1994)  reported that all 21 patients were RAST positive for peach, cherry, apricot and plum (class 2-4). 16 of the 21 patients (76%) had a positive RAST result for grasses, and 14 (66.6%) had a positive RAST result for birch. Pastorello et al. (1994)  and Pastorello et al. (1999)  used 1D SDS PAGE with a 6% stacking gel and a 7.5% to 20% gradient separating gel. Samples were denatured by heating at 100° C for 5 minutes in SDS and beta-mercaptoethanol, then centrifuged at 10,000xg for 5 minutes. Sanchez-Monge et al. 1999  used 1D SDS-PAGE on a 10% to 20% tricine precast polyacrylamide gel (Novex, San Diego, Calif) in nonreducing conditions. Pastorello et al. (1994)  electroblotted proteins to a nitrocellulose membrane, pore size 0.2 to 0.45 µm in 25 mmol/L Tris, 192 mmol/L glycine, 20% methanol at 4°-8° C. The unoccupied protein binding sites on the nitrocellulose membrane were then saturated by placing the membrane in blocking solution, phosphate-buffered saline (PBS) pH 7.4 with 0.5% (v/v) Tween 20 for 30 minutes at room temperature. The nitrocellulose blot was cut into strips and incubated with sera, diluted 1:4 in blocking solution, overnight. Each strip was washed three times with washing solution, 0.9% (w/v) NaCl, 0.5% (v/v) Tween 20, on a shaker. After washing, the IgE-binding components were detected by incubating each strip with iodine 125–labeled anti-human IgE antiserum diluted 1:4 (v/v) in blocking solution for 4 hours. Blotted nitrocellulose strips were washed three times with washing solution, dried, and exposed on autoradiography film in exposure cassettes at –70° C. Exposure time ranged between 4 and 60 hours, depending on the amount of labeled antiserum bound. Sanchez-Monge et al. 1999  electrotransferred proteins onto nitrocellulose membranes. After blocking with 5% (w/v) BSA in PBS for 2 hours at room temperature, the blots were incubated overnight with each individual serum (1:10 v/v dilution in 0.5% (w/v) BSA, 0.05% (v/v) Tween-20 in PBS). After washing 4 times with 0.1% (v/v) Tween-20 in PBS, membranes were overlaid with mouse anti-human IgE mAb HE-2 ascitic fluid (1:3000 v/v dilution) for 2 hours and then washed and incubated with a rabbit anti-mouse IgE peroxidase-conjugated antibody for 1 hour. Detection of IgE-binding components was achieved by enhanced chemiluminescence. Pastorello et al. (1994)  reported strong IgE binding to a 13 kDa polypeptide by sera from 19 peach allergic patients, and also found IgE-reactivity towards components with molecular masses of 14, 17, 20, 48, 50, and 70 kDa. However, the 13 kDa species was subsequently found to have a mass of 9 kDa, corresponding to Pru p 3. Pastorello et al. (1999)  reported that serum IgE from 15 patients reacted to a band at 9 kDa (one only weakly) in peach extract. This binding could be inhibited by the purified peach nsLTP. Several of the sera (5) with IgE reactivity to birch pollen also showed strong IgE binding to a 43 kDa protein and weaker bands near 17 and 67 kDa. Sanchez-Monge et al. 1999  reported that an allergen with a mass of about 13 kDa was recognized in the apple extract by 9 of 10 sera (90%) and in the peach preparation by all 10 sera (100%). Binding could be fully inhibited by the purified nsLTP. Pastorello et al. (1994) , Cuesta-Herranz et al (1998)  and Pastorello et al. (1999)  used fresh peach. Crespo et al. (2002)  used fresh food masked in a vehicle containing a mix of orange and pineapple juices, sugar, wheat meal, and liquid coloring (McCormick, Hunt Valley, USA). Subjects were challenged first randomly with either food or placebo (vehicle), divided in five doses given every 15 min. The verum and placebo challenges were performed on two separate days. After each challenge the patient was observed for 3 h. Confirmation by DBPCFC was accepted if the subject had symptoms after provocation with the active substance, and no symptoms after the placebo challenge. Crespo et al. (2002)  used initial open food challenges. Subjects showing a positive reaction on open provocation were subsequently challenged in a double-blind fashion. Open-feeding of the food in usual quantities followed all negative blinded challenges. Pastorello et al. (1994) , Cuesta-Herranz et al (1998)  and Pastorello et al. (1999)  used open food challenge. Rodriguez-Perez et al (2003)  reported that 29 patients had been challenged. Crespo et al. (2002)  challenged 65 patients with confirmed clinical fruit allergy. Some patients were not challenged with a food if there was a "convincing" anaphylactic history. Pastorello et al. (1999)  challenged 12 patients. Cuesta-Herranz et al (1998)  challenged 70 patients. Pastorello et al. (1994)  challenged 23 patients with a clear positive history of peach allergy (with immediate reaction), positive SPT and RAST results for peach and also a positive RAST result of at least class 2 for cherry, apricot, and plum. A total of 115 OFCs were performed in these 23 patients. Pastorello et al. (1994)  and (1999)  started with a small portion (250 mg). Each patient was asked to chew the fruit for 1 minute and then spit it out. If no symptoms appeared within 15 minutes, the patient was asked to repeat the test, with double the amount of fruit. The challenge lasted until the onset of objective symptoms (as described above) or up to the maximum single dose of about 64 gm, that is, the approximate mean weight of a fresh peach without the stone. Patients were asked not to spit out the last two doses (32 and 64 gm) but to swallow the fruit instead. Cuesta-Herranz et al (1998)  used the above method for oral challenge and also rubbed patients' forearm with peach for 30 seconds and examined after 15 minutes. Pastorello et al. (1994)  found that all the patients reported subjective symptoms after chewing the dose of 500 mg. The majority of the patients presented objective symptoms at the dose of 4 to 8 gm. Only two patients had gastrointestinal symptoms: one had abdominal pain and vomiting after consuming 32 gm, and one had abdominal pain after consuming 64 gm. Pastorello et al. (1999)  found that the provocation doses ranged from 4 to 64 g. of fresh peach. Pastorello et al. (1994)  reported 17 had oropharyngeal symptoms (oral irritation, local itching, angioedema, throat tightness, lip tightness, oral mucosal papules or blisters) and two patients had gastrointestinal symptoms: one had abdominal pain and vomiting after the dose of 32 gm, and one had abdominal pain after the dose of 64 gm. Cuesta-Herranz et al (1998)  found that 60/70 (85.7%) patients showed oral allergy syndrome, OAS, which began immediately, 43/70 (61.4%) showed contact urticaria, CU, on being rubbed with peach, 18/70 (25.7%) showed systemic symptoms, SS, all within 30 minutes of the peach oral challenge. 33 showed OAS and CU; 17 OAS and SS; 12 CU and SS; 11 OAS, CU and SS. Systemic symptoms were 23 urticaria, 12 angioedema, 6 gastrointestinal symptoms, 4 rhinitis, 3 dyspnea, and 2 hypotension. All 70 patients reacted to unpeeled peach but only 61% reacted to peach pulp. Patients who reacted to pulp also reported reaction to peach juice. Crespo et al. (2002)  judged that 38/65 patients were allergic to peach with 31 positive DBPCFC and 7 histories of anaphylaxis. This was the most common allergy in the group with melon with 21/65 allergic next. Rodriguez-Perez et al (2003)  report that their 29 patients were DBPCFC positive without giving details. Many studies have shown a close relationship between peach allergy and allergy to other fruits. For example, Crespo et al. (2002)  tested 65 adults with allergy to one or more fruits for allergy to other fruits and described the pattern of sensitivities. It is likely that this is due to nsLTPs acting as "panallergens" (Pastorello et al. (1999) ; Asero et al. 2000 ; Asero et al. 2002 ). There is evidence of IgE cross-reactivity between peach nsLTP, Pru p 3, and mugwort pollen nsLTP, Ar v 3. However, there is some debate on whether peach or pollen is the primary sensitising agent. Pastorello et al. (2002)  argues that peach sensitises whilst Lombardero et al. (2004)  have evidence of stronger sensitisation to the Artemisia pollen allergen Art v 3. If sensitisation to Art v 3 occurs, it may not lead to allergy to peach (Garcia Ortiz et al. (1996) ; Garcia-Selles et al. 2002 ). There is clear evidence that peach allergens, especially the nsLTPs, are concentrated in the peach peel. Carnes et al. (2002)  found that LTP concentration in peel extracts is approximately seven times greater than in pulp. In the study of Lleonart et al (1992) , 75% of patients were IgE-reactive to skin and 52% to peach flesh. In the study of Sanchez-Monge et al (1999) the patients with IgE towards LTP had more severe reactions, and it was not associated with pollen allergy. There is also evidence that Pru p 3 from peach leaves can act as a respiratory allergen and cause occupational rhinoconjunctivitis and asthma (Garcia et al. 2004 ). The patient described by Garcia et al. (2004) was initially able to tolerate ingestion of peach but subsequently started to suffer oropharyngeal itching after peach ingestion. Sanchez-Monge R, Lombardero M, Garcia-Selles FJ, Barber D, Salcedo G.
Lipid-transfer proteins are relevant allergens in fruit allergy. Lleonart R, Cistero A, Carreira J, Batista A, Moscoso del Prado J. Food allergy: identification of the major IgE-binding component of peach (Prunus persica). Relationship between peach lipid transfer protein specific IgE levels and hypersensitivity to non-Rosaceae vegetable foods in patients allergic to lipid transfer protein. Shin DH, Lee JY, Hwang KY, Kim KK, Suh SW.
High-resolution crystal structure of the non-specific lipid-transfer protein from maize seedlings. Rodriguez-Perez R, Fernandez-Rivas M, Gonzalez-Mancebo E, Sanchez-Monge R, Diaz-Perales A, Salcedo G.
Peach profilin: cloning, heterologous expression and cross-reactivity with Bet v 2. Garcia BE, Lombardero M, Echechipia S, Olaguibel JM, Diaz-Perales A, Sanchez-Monge R, Barber D, Salcedo G, Tabar AI. Respiratory allergy to peach leaves and lipid-transfer proteins. Fernandez-Rivas M, Gonzalez-Mancebo E, Rodriguez-Perez R, Benito C, Sanchez-Monge R, Salcedo G, Alonso MD, Rosado A, Tejedor MA, Vila C, Casas ML. Clinically relevant peach allergy is related to peach lipid transfer protein, Pru p 3, in the Spanish population. Pajno GB, Passalacqua G, La Grutta S, Vita D, Feliciotto R, Parmiani S, Barberio G.
True multifood allergy in a 4-year-old child: a case study. Pollen-related allergy to peach and apple: an important role for profilin. Cuesta-Herranz J, Lazaro M, de las Heras M, Lluch M, Figueredo E, Umpierrez A, Hernandez J, Cuesta C.
Peach allergy pattern: experience in 70 patients. Cuesta-Herranz J, Lazaro M, Martinez A, Figueredo E, Palacios R, de-Las-Heras M, Martinez J.
Pollen allergy in peach-allergic patients: sensitization and cross-reactivity to taxonomically unrelated pollens. Carnes J, Fernandez-Caldas E, Gallego MT, Ferrer A, Cuesta-Herranz J.
Pru p 3 (LTP) content in peach extracts. Pastorello EA, Farioli L, Pravettoni V, Ortolani C, Ispano M, Monza M, Baroglio C, Scibola E, Ansaloni R, Incorvaia C, Conti A. The major allergen of peach (Prunus persica) ia a lipid transfer protein. Pastorello EA, Pravettoni V, Farioli L, Rivolta F, Conti A, Ispano M, Fortunato D, Bengtsson A, Bianchi M.
Hypersensitivity to mugwort (Artemisia vulgaris) in patients with peach allergy is due to a common lipid transfer protein allergen and is often without clinical expression. Lombardero M, Garcia-Selles FJ, Polo F, Jimeno L, Chamorro MJ, Garcia-Casado G, Sanchez-Monge R, Diaz-Perales A, Salcedo G, Barber D.
Prevalence of sensitization to Artemisia allergens Art v 1, Art v 3 and Art v 60 kDa. Cross-reactivity among Art v 3 and other relevant lipid-transfer protein allergens. Garcia Ortiz JC, Cosmes PM, Lopez-Asunsolo A. Allergy to foods in patients monosensitized to Artemisia pollen. Garcia-Casado et al. (2003)  reported that peptides corresponding to residues 11 to 25, residues 31 to 45 and, to a lesser extent, residues 71 to 85 bound to human IgE. Site directed mutants were constructed and while changes at residue 80 and 91 did not change IgE binding, the R39A/T40A/R44A mutant showed a substantial decrease (approximately 5 times) of IgE binding. Process, chemical, enzymatic:The allergen is thermostable (Brena et al 2000)  and highly resistant to pepsin digestion (Asero et al 2000) . Nature of main cross-reacting proteins:IgE cross-reacts with LTP's from other Prunoideae (eg apricot). It is likely that there is much wider cross-reactivity with nsLTPs acting as "panallergens" (Pastorello et al. 1999 ; Asero et al. 2000 ; Asero et al. 2002 ; Crespo et al. (2002) ). There is evidence of IgE cross-reactivity between peach nsLTP, Pru p 3, and mugwort pollen nsLTP, Ar v 3 (Pastorello et al., 2002 ; Lombardero et al., 2004 ). There is evidence of IgE cross-reactivity between peach and citrus (orange and lemon) LTPs (Ahrazem et al. 2005 ). However, Asero et al (2005)  show that bean extract does not significantly bind anti-peach LTP IgE. Allergen properties & biological function:Non-specific lipid-transfer protein, nsLTP. May be involved in wax or cutin deposition. nsLTPs have four alpha-helices around a central expandable cavity which binds one or two molecules of lipid. The helices are linked by four disulphide bridges. nsLTPs have also been reported to act as plant defense proteins against bacterial and fungal infections and form the PR14 family of pathogenesis related proteins. Sanchez-Monge et al (1999)  extracted ground peach skins with phosphate buffered saline (1:10, v:v) for 1h at 4°C. After centrifugation at 10,000 rpm for 25 min, 4°C, the supernatants were dialysed and freeze dried. The protein was then exchanged into 0.1M ammonium acetate using a desalting column, freeze-dried and defatted with cold acetone, followed by ethanol:ether (1:3, v:v) for 1h at 4°C. The residues were dried and applied to a C4 reverse phase column (Vydac 22x250mm, 10um particle size) using a two step linear gradient of acetonitrile in 0.1% (v:v) trifluoroacetic acid (0-40% in 120 min and 40-85% in 30 min; using a flow rate of 1ml/min). Alternative purification methods have been reported by Pastorello et al. (1999)  using cation-exchange chromatography followed by gel filtration and by Carnes et al. (2002)  using gel filtration and hydrophobic interaction chromatography. Diaz-Perales et al. (2002)  reported the expression of recombinant Pru p 3 in the yeast Pichia pastoris using the pPIC 9 vector. An additional N-terminal glutamate was required for expression. The recombinant product was purified by gel-filtration chromatography followed by RP-HPLC. The IgE binding of native and recombinant Pru p 3 was similar. Diaz-Perales et al (2003)  reported further immunological characterization of the recombinant protein. Zuidmeer et al. (2005)  also purified recombinant Pru p 3 (and Mal d 3) using the yeast Pichia pastoris. Proteins were purified via cation exchange chromatography. The sequences listed (Pastorello et al. 1999 ; Botton et al. 2002 ) are for the mature protein. The gene sequence probably includes an N-terminal signal peptide. Pastorello et al. (1999)  note a surprisingly high proline content. It is not clear if this makes this nsLTP sequence particularly rigid and stable against proteolysis. Brenna O, Pompei C, Ortolani C, Pravettoni V, Farioli L, Pastorello EA. Technological processes to decrease the allergenicity of peach juice and nectar. Pastorello EA, Ortolani C, Baroglio C, Pravettoni V, Ispano M, Giuffrida MG, Fortunato D, Farioli L, Monza M, Napolitano L, Sacco M, Scibola E, Conti A. Complete amino acid sequence determination of the major allergen of peach (Prunus persica) Pru p 1. Duffort OA, Polo F, Lombardero M, Diaz-Perales A, Sanchez-Monge R, Garcia-Casado G, Salcedo G, Barber D.
Immunoassay to quantify the major peach allergen Pru p 3 in foodstuffs. Differential allergen release and stability under physiological conditions. Diaz-Perales A, Sanz ML, Garcia-Casado G, Sanchez-Monge R, Garcia-Selles FJ, Lombardero M, Polo F, Gamboa PM, Barber D, Salcedo G.
Recombinant Pru p 3 and natural Pru p 3, a major peach allergen, show equivalent immunologic reactivity: a new tool for the diagnosis of fruit allergy. Garcia-Casado G, Pacios LF, Diaz-Perales A, Sanchez-Monge R, Lombardero M, Garcia-Selles FJ, Polo F, Barber D, Salcedo G.
Identification of IgE-binding epitopes of the major peach allergen Pru p 3. Botton A, Begheldo M, Rasori A, Bonghi C, Tonutti P.
Diaz-Perales A, Lombardero M, Sanchez-Monge R, Garcia-Selles FJ, Pernas M, Fernandez-Rivas M, Barber D, Salcedo G.
Lipid-transfer proteins as potential plant panallergens: cross-reactivity among proteins of Artemisia pollen, Castanea nut and Rosaceae, with different IgE-binding capacities. Pasquato N, Berni R, Folli C, Folloni S, Cianci M, Pantano S, Helliwell JR, Zanotti G.
Crystal structure of peach Pru p 3, the prototypic member of the family of plant non-specific lipid transfer protein pan-allergens. Asero R, Mistrello G, Roncarolo D, Amato S, Falagiani P.
Why do lipid transfer protein-hypersensitive patients tolerate bean (and other legumes)? Zuidmeer L, van Leeuwen WA, Budde IK, Cornelissen J, Bulder I, Rafalska I, Besoli NT, Akkerdaas JH, Asero R, Rivas MF, Mancebo EG, van Ree R.
Lipid transfer proteins from fruit: cloning, expression and quantification. Ahrazem O, Ibanez MD, Lopez-Torrejon G, Sanchez-Monge R, Sastre J, Lombardero M, Barber D, Salcedo G.
Lipid transfer proteins and allergy to oranges. Diaz-Perales A, Garcia-Casado G, Sanchez-Monge R, Garcia-Selles FJ, Barber D, Salcedo G.
Nature of main cross-reacting proteins:There is IgE cross-reactivity between birch pollen profilin, Bet v 2, and Pru p 4. Other pollen and Roseaceae profilins, such as Mal d 4, are also likely to cross-react. Allergen properties & biological function:Profilin is an actin binding protein. Rodriguez-Perez et al. (2003)  expressed recombinant Pru p 4.01 in E. coli. Pru p 4.01 was identified immunologically but no purification was reported. Other biochemical information:The classification "major" above is given because 15/29 patients were reactive in the study of Rodriguez-Perez et al (2003) . However, studies of other groups of patients have been published with less than 50% of patients showing IgE against Pru p 4.